Posted by Bravado Cooking for Men in Classic French Dishes, Classic Soups, Recipes. Bravado cooking is about a number of things, one of which is a respect for the great classic dishes. There is a reason why we have classics – because they are dependably good. I was reminded of this a few nights ago when I took a dessert to a dinner party. I could have made a classic Tarte Tatin and wowed the crowd, but then, I thought, they have had that before so I’ll try something new. I experimented with a recipe from Jamie Oliver (The Naked Chef). It was coconut banana bread with a mango and yogurt topping. It was really not very good and afterwards I said to myself “stick with the classics”. 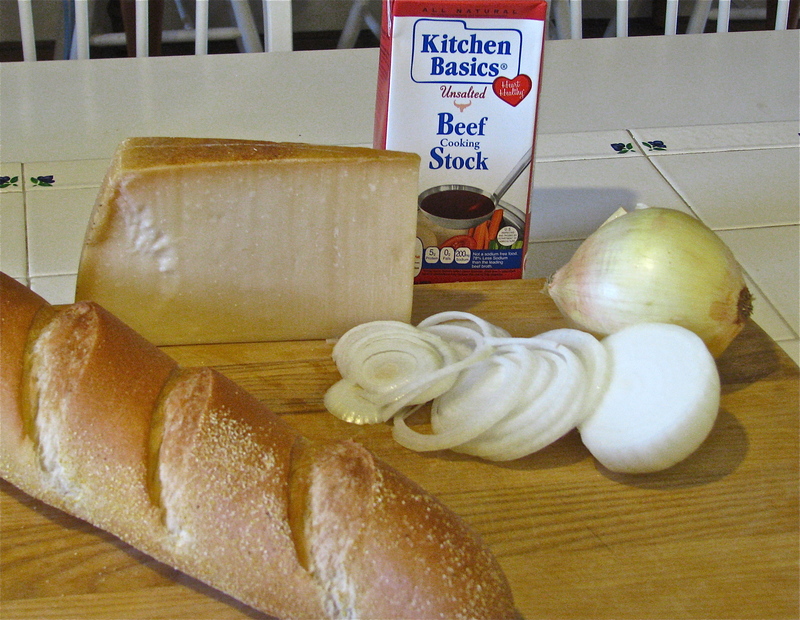 In recent weeks we have been exploring the great French classics and there are few better than French onion soup. This is the gold standard of soups and any worthy Bravado chef needs to be able to make this great dish. I like the simple, uncluttered version of this soup. In the U.S. we tend to complicate this dish, covering it with a thick lid of gooey cheese and bread that is a meal by itself. I think we have all seen some poor soul stretching long strands of cheese halfway across the room hoping to finish the initial hurdle of bread and cheese and get to the soup. Julia Child promoted this “gratinee” version in her famous television shows, but this is really not what the French had in mind. 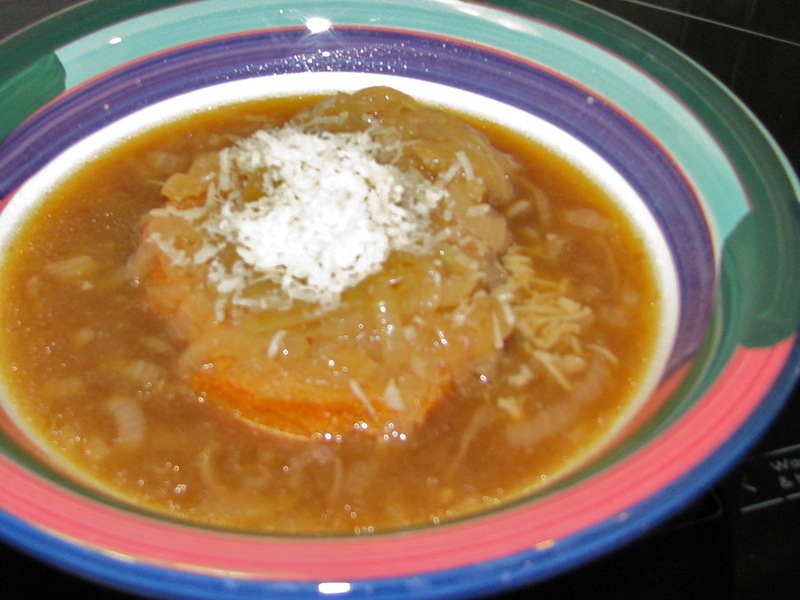 French onion soup starts with onions that have been cooked slowly and separately until they have turned golden brown and the natural sugars in the onions have started to caramelize. It is then simmered with white wine and beef stock. It is typically served with some form of grated cheese such as Parmesan or Gruyere. Bread is also a usual accompaniment either in the form of a simple baguette, which can be broken and dipped in the soup, or with toasted slices of baguette, over which the soup is poured. 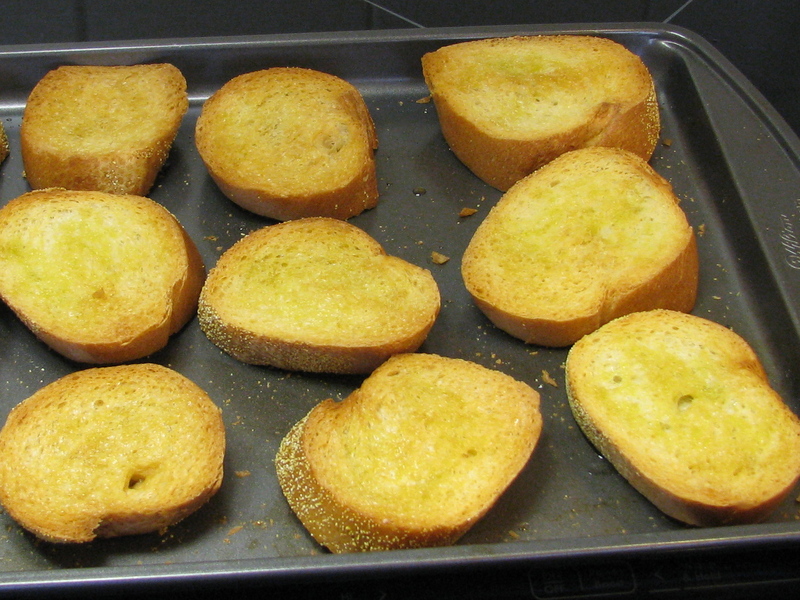 Below, we’ll show you the best way to make the toast, but feel free to try the soup with plain pieces of baguette. A teaspoon of Cognac is the final touch and must not be forgotten. 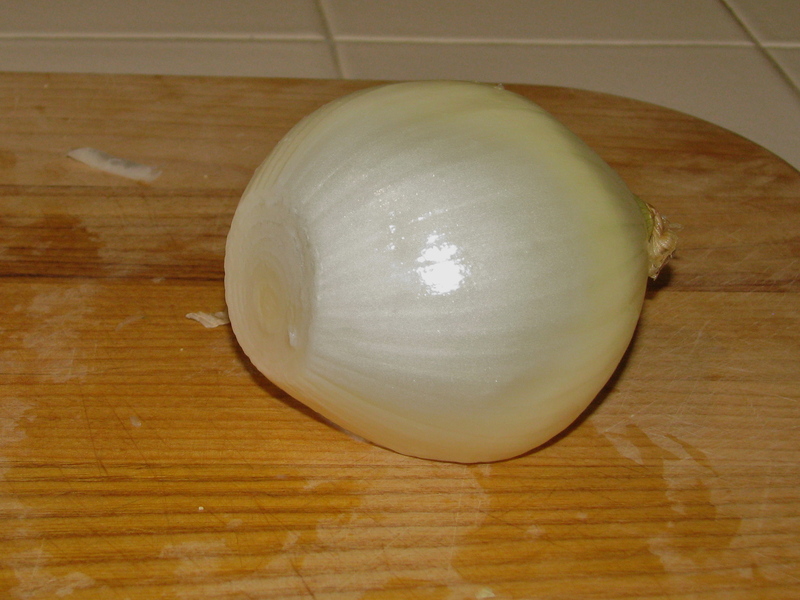 How to slice an onion: Always think of an onion like the Earth. Start by slicing off a piece by the equator. Next slice off the North Pole (South Pole if you’re a lefty). 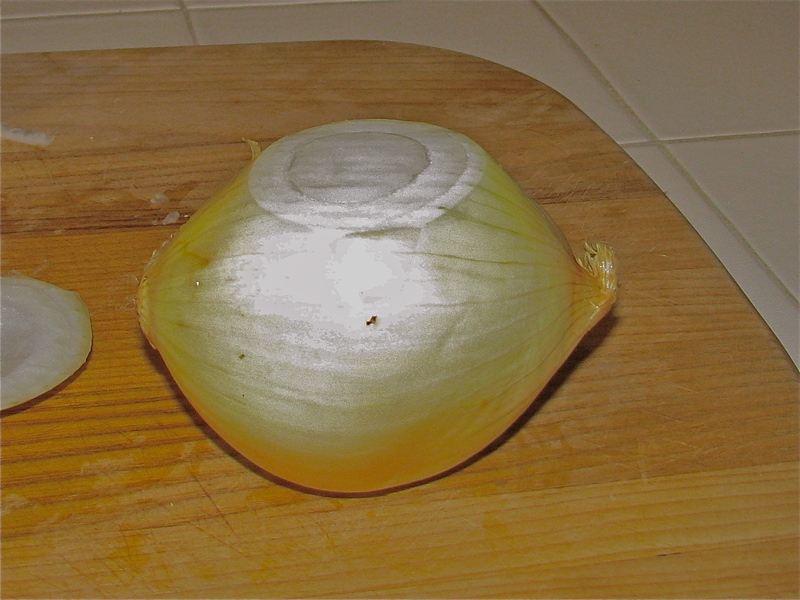 Peel the onion, set it on the cutting board on the flat side by the equator and begin slicing by the North Pole. Slice the onions very thinly. Heat the olive oil and butter in a large stockpot or Dutch oven, add the onions gently breaking them apart in the pot, mix well and cook covered over low heat for 15 minutes, stirring a few times. Uncover, add the sugar and salt, mix well, raise the heat to medium and cook for about 30-45 minutes until the onions begin to brown and caramelize. 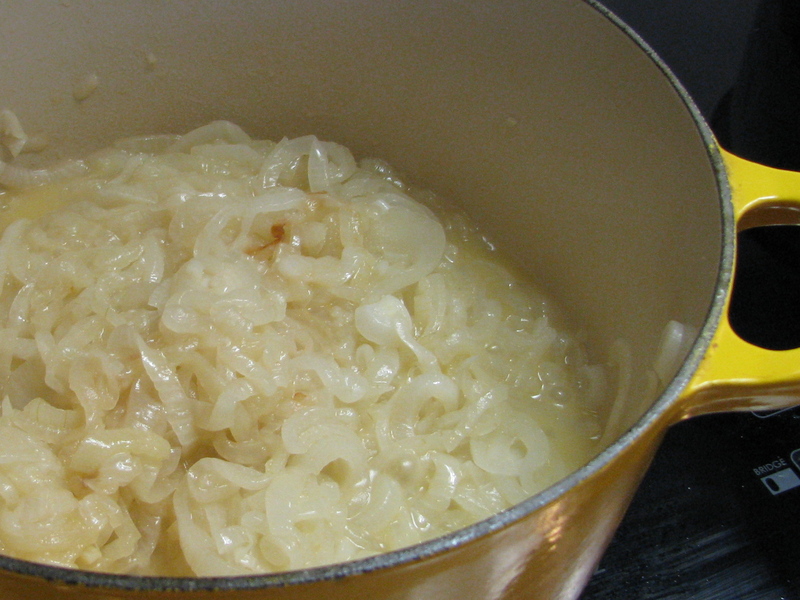 You want to stop as soon as they begin to caramelize – don’t let that process go too far or you will have a very mushy soup. They should have a light golden color. 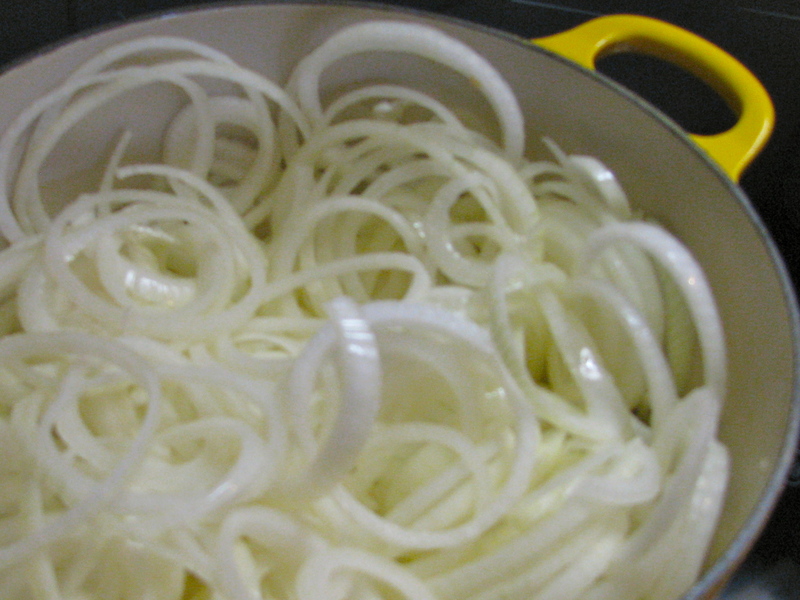 When the onions have reached the proper point, stir in the flour, stir well. Add the beef stock and wine, and simmer over low heat for 45 minutes, uncovered, stirring occasionally. While you are cooking the onions, cut the baguette into rounds about 1” thick, place them on a baking sheet, baste with a little olive oil and put in the oven for 30 minutes, turning the rounds over midway through the process. Put one or two rounds into each soup bowl, ladle the soup on top, add 1 tbsp. of Cognac and grated cheese and serve while still very hot. You can count on the fans going wild over this soup. Women sometimes give little shivers of intoxicated excitement and the first spoonful. Try it and you will see. The soup saves well in the refrigerator and is a great light lunch or late evening snack. Save the toast rounds in a plastic zip-loc bag. Next week: Coq Au Vin! !